If the difference between a student's success and failure were something specific you could teach, wouldn't you? Engage in practices that enhance cognitive flexibility. Wilson and Conyers explain metacognition and how it equips students to meet today's rigorous education standards. They present a unique blend of useful metaphors, learning strategies, and instructional tips you can use to teach your students to be the boss of their brains. Sample lessons show these ideas in a variety of classroom settings, and sections on professional practice help you incorporate these tools (and share them with colleagues and parents) so that you are teaching for and with metacognition. 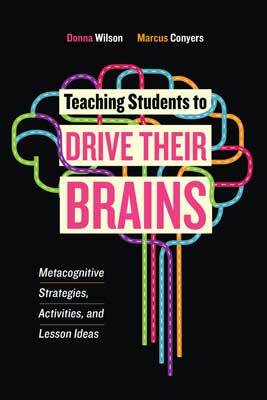 Research suggests that metacognition is key to higher student achievement, but studies of classroom practice indicate that few students are taught to use metacognition and the supporting cognitive strategies that make learning easier. You can teach metacognition to your students, so why wouldn't you? This book shows you how. DONNA WILSON, leader of the academic team at BrainSMART and the Center for Innovative Education and Prevention, is an educational and school psychologist and former teacher. Wilson is codeveloper of graduate studies in mind, brain, and education science at the master’s through doctoral levels and has facilitated professional development with tens of thousands of educators. MARCUS CONYERS is a doctoral researcher at the University of Westminster and director of research and development for the Center for Innovative Education and Prevention. As the coauthor of 20 books on applications of mind, brain, and education science, he has led statewide initiatives and worked in 30 countries, reaching more than 100,000 administrators and teachers.